“The Big C” has a similar storyline to “Breaking Bad,” though it mostly stays on the lighthearted side, and only occasionally delves into purposefully unlawful behavior. Like Walt of “Breaking Bad,” Cathy Jamison (Laura Linney) has just found out that she has cancer and very little life left to live. With her last years, Cathy decides that she is going to start living her life the way she has always wanted to. Transforming from a rule-following responsible wife and mother into a free-spirit, Cathy makes the most out of her remaining time, much to the dismay of those close to her. As a 42-year-old schoolteacher, Cathy begins a passive approach to education, though she takes a personal interest in one of her most rambunctious students (Gabourey Sidibe from Precious). At home she refuses to accept the childish behavior from her husband (Oliver Platt) or the selfish behavior from her son. She also reunites with her radical activist brother, finding that they share more in common now that social constraints don’t hold her back any longer. Linney is more than enjoyable as Cathy, a role which brought her a Golden Globe, and she is backed up by a compelling ensemble cast. The show itself is not nearly as original or profound as it seems to think it is, but there are still moments of enjoyment within the serio-comedy. Season two advances the storyline by finally revealing the truth to all major cast members. Cathy must now deal with the different reactions from those close to her, as they all react to the news in their own way as well. The second season has thirteen episodes on three discs. The final disc includes deleted scenes and an outtake reel. Ti West may not have any large studio budget projects under his belt, but he is becoming an increasingly interesting filmmaker to watch in the horror field. His 1970s drive-in spirited House of the Devil, moving on to direct the sequel to Eli Roth’s Cabin Fever. The Innkeepers is a different kind of horror film, quietly and carefully established. Everything from the storyline to the camera work seems much more deliberate this time around, and it provides plenty of thrills along the way. There is not the mass amount of blood and gore that filled Cabin Fever 2: Spring Fever. All of the frights come from solid filmmaking and classic techniques. It is the simplicity of The Innkeepers which allows for the scares to work. The less we see, the more our imagination is allowed to wander. Alone in an empty house is a frightening enough idea for many, without the addition of ghosts and haunted halls. All of The Innkeepers takes place at The Yankee Pedlar Inn in New England during its closing weekend. There are only a handful of guests and two employees, Claire and Luke (Sara Paxton and Pat Healy) during the final weekend open. Claire and Luke take it upon themselves to record the ghosts on tape for fame and fortune. And because they have nothing better to do with the final days of their minimum wage jobs. Much of The Innkeepers feels more like an independent comedy than it does a horror film, except that the camera work and music continually remind us that we are in a suspense-filled world of unexpected realities. There are many of the expected scares, from recorded voices and pianos playing themselves. There are frights and scares and a surprising twist, but the manner in which West plays all of these cliché moments out is wholly original. The Blu-ray includes a commentary track with writer/director/editor West, along with producers Peter Phok and Larry Fessenden, and 2nd unit director/sound designer Graham Reznick. A second commentary track has West along with stars Paxton and Healy. A behind the scenes featurette is also included, as well as a trailer, but the high definition presentation of this film alone is nothing to scoff at. If ever there was a holiday in need of a horror film, it certainly isn’t Mother’s Day. I’m sure that there are some mothers out there who enjoy a bloody action film from a horror director more than they would flowers or gifts, but I have yet to meet them. Most tend to shy away from these type of films, so I guess this is a movie for all of those gore hounds who need something shocking after doing all of the proper sonly duties of the holiday. 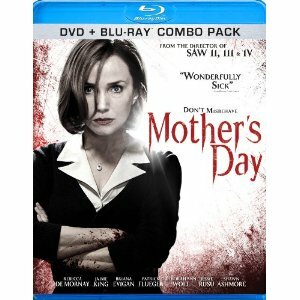 Mother’s Day is not really about the holiday anyway, and the release of the Blu-ray prior to the holiday is just a marketing ploy. With a film which has been shelved since 2009, they are attempting to give it as much relevance as possible. Director Darren Lynn Bousman is best known for his work in the Saw franchise, including the first three sequels. He is mostly known for his work as a horror film director, which is probably why this film feels more like horror than action or suspense. There is a sadistic and unpredictable nature to the film’s villains, as well as the slow increase in body count as the innocent victims slowly diminish. Even the way that the story unfolds is filled with the uncertainty and chaos of a horror film. The fact that it is based on a Troma film only solidifies the horrific in the film’s basic structure. After an unseen bank robbery has gone wrong, three brothers return to their mother’s house to find that she is no longer there. Instead there are new owners and a house full of party guests. These innocent people are immediately taken hostage and used as playthings until they are able to save their injured brother. The arrival of their mother (Rebecca De Mornay) only aggravates the situation even further. There is a brutal edge to the film, making it feel like a mild version of Funny Games. Some of the film may be unoriginal, but there are still elements of suspense and horror which make it a film worth seeing for die-hard fans of the genre. The Blu-ray includes an audio commentary with director Darren Lynn Bousman and actor Shawn Ashmore. The high definition is also worthwhile, as the photography is mostly solid.